The great @perezartist giving me an art lesson. "The head goes on TOP of the body! The FEET go on the bottom!" No wonder he's a star! Dragon*Con badge full artwork and cover to "The Art of George Perez"
Now that Dragon*Con has passed, I can finally show the art I did for the 25th Anniversary badges. This was inspired by my beautiful wife Phoenicia Flynn, who was also the model for the belly dancer assassin Phoenicia in WALLY WOOD'S T.H.U.N.D.E.R. AGENTS. I am so proud of this piece that I've decided to use it as the cover for THE ART OF GEORGE PEREZ, coming out in 2012. 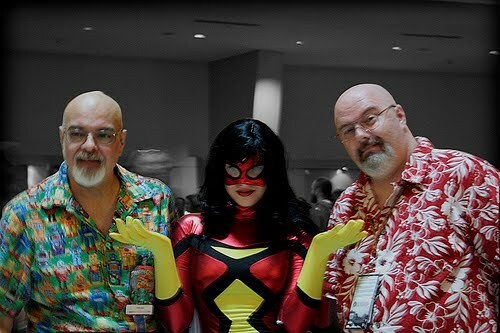 First ever George Perez cosplay? From the recent DRAGON*CON 2011 (02-05 Sep 2011), is this the first ever George Perez costume cosplayer? George, being a terrific guy, always does these great $25 head sketches at the Hero Initiative booth. This year (Dragoncon 2011) I gave him my Bat-themed sketchbook and told him to pick anyone he liked. He said "You might be surprised who I pick..." and proceeded to knock out this terrific Penguin! Love the Bat shape in the smoke and the little penguin next to his name. He said he added that in case anyone couldn't tell who it was supposed to be. As if! George continues to be one of the greats as well as a perfect gentleman, and I'm delighted to have him in my book! I'm looking forward to seeing a lot of my fans there. Hero initiative, the non-profit organization that raises money for comic creators in need, is proud to announce its attendance at Dragon*Con over labor day weekend, September 2nd through 5th in Atlanta Georgia. Hero will be located at Booth #BT23. Hero's special guests will be world-renown artists Steve Dillon and George Pérez. Dillon is the artist of the critically acclaimed Preacher and Wolverine: Origin. Pérez, the longtime artist of New Teen Titans and Avengers, is also writing the relaunched Superman for DC Comics, which starts in September. Both have generously committed their time to raise money for Hero Initiative at Dragon*Con, so stop by booth BT23 and be the lucky recipient of a sketch or signature while contributing to a wonderful cause. Captain America writer/artist Karl Kesel will also be at the Hero booth on Sunday. While you are getting a coveted sketch ask our helpful volunteers about becoming a Hero Initiative member! Do It! Just submitted the badge art for this year's Dragon*Con (celebrating its 25th year!) and I'm proud to say that the organizer Pat Henry loved it!. Unfortunately, due to fears of counterfeiting, I can't post the art here or anywhere until after the convention ends on Sept. 5th, so Dragon*Con attendees will get to see it first at the show.